Before taking to the stage and wowing their fans in Castlebar, Jedward spoke to The Mayo News about life on the road, their upcoming album, their social life, party plans and more. A very giddy John and Edward were obviously hyped up about starting their national tour – though John did find it hard to stifle the odd yawn. Understandable in light of the fact they have just finished the whopping 57-date X Factor tour. They played in Glasgow on Sunday, April 6, travelled back to Ireland on Monday and arrived in Castlebar the next day to kick off their own 15-date national tour. The boys were looking forward to getting on stage – and getting back into some of the memorable outfits they wore on X Factor. They giddily explained that they were dying to wear those clothes again, which they said were precious, ‘like gold dust’. 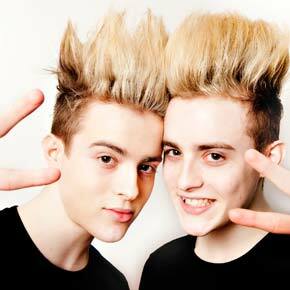 Jedward revealed that their second single, the follow up to ‘Ice Ice Baby’, comes out on May 28. They’re not sure yet what the song will be, “but Louis has loads of ideas … it will be up tempo though.” The boys are also busy working on their debut album, which they disclosed would be out in June. John and Edward also said that their Irish tour will have plenty of surprises. They said they would perform not just the songs from X Factor, but also lots of new covers that fans hadn’t heard them sing before, including ‘I’ve got a feeling’ (Black Eyed Peas), ‘Pop Muzik’ (M) and ‘Break My Stride’ (Blue Lagoon) – all of which their Kiltimagh-born manager Louis Walsh picked especially for them. They believe it’s important to sing new songs for their audience. “Imagine if we just sang ‘Ice Ice Baby’ 14 times?” John giggled.